Beautiful small apartment house "Chiebrendli". In the district of Steinacher, south-west facing position. Private: terrace, garden furniture. In the house: central heating system. Motor access to the house. In Winter: please take snow chains. Single garage. Shopping centre 2.4 km, restaurant 200 m, bakery 2.2 km, bicycle rental 2.4 km, bus stop "Steinacher" 50 m, railway station "Grindelwald Dorf" 2.5 km, outdoor swimming pool 3.5 km, indoor swimming pool 2.4 km. Golf course (9 hole) 2.8 km, tennis 2.4 km, minigolf 2.3 km, sports centre 2.4 km, gondola lift 2.2 km, slopes 100 m, ski rental 2.2 km, ski bus stop 50 m, children's playground 2.4 km. Well-known lakes can easily be reached: Thuner-/Brienzersee 20 km. Please note: ski bus (free of charge). Free ski bus service to the ski region First and Männlichen 7 Kleine Scheidegg. 2-room apartment 45 m2, on the ground floor, south facing position. 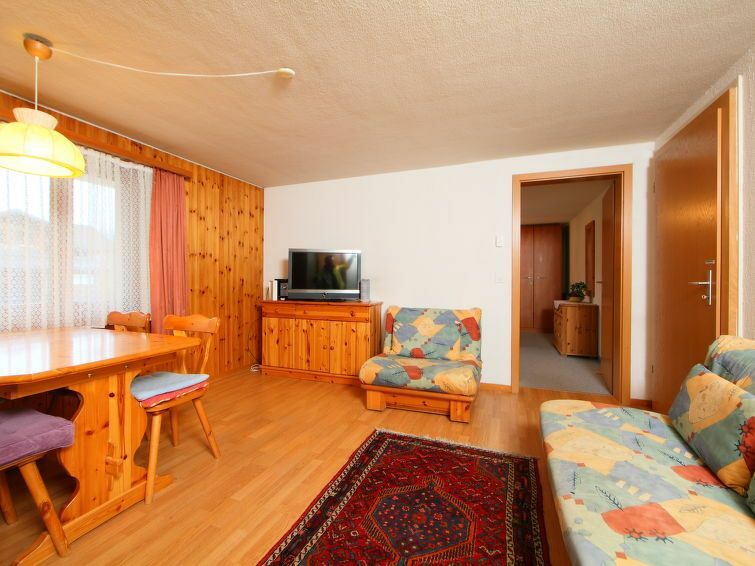 Cosy furnishings: living/dining room with cable TV (flat screen), radio. Exit to the terrace, south facing position. 1 room with 1 double wall-trunk bed (2 pers. 2 x 90 cm, length 200 cm). Small kitchenette (2 hot plates, oven, electric coffee machine, raclette grill fondue Set (cheese)). Shower/WC. Underfloor heating. Small patio 70 m2, south facing position and west facing position. Terrace furniture, deck chairs (2), box-room. Marvellous view of the mountains. Garage. Please note: non-smokers only. Fire extinguisher.